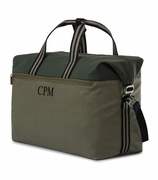 Men's lightweight travel bag. Take it on a trip. 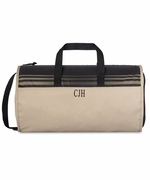 Perfect bag for overnight travel or vacation. Roomy interior for ease in organizing. Sporty look with graphic pattern design, 600D polyester with adjustable shoulder strap, locker loop and top grab handles. Includes a three letter monogram. EMBROIDERY WILL BE LIGHT GRAY WITH AN ACCENT MONOGRAM. 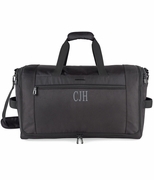 Personalized gift for men travel bag measures 18"W x 10"H, 10" bottom. Hand carry or use the over the shoulder detachable carry strap. Zipper closure. Purchased these travel bags for my groomsmen. The guys loved them and appreciated the monogram. Quality bag and fine service.